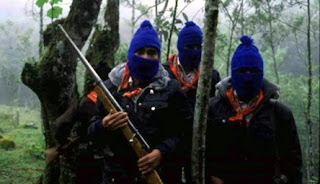 "In an operation that bears all the marks of drug war-style repression, state and federal police detained six adherents to the Other Campaign, one Zapatista, and one unaffiliated man in Agua Azul, Chiapas. The military was also involved; it shot six warning shots into the air with live ammunition at a protest blockade, and it provided military intelligence that Chiapas state officials say was used to detain the men." The Mexican state has used violent military tactics on indigenous groups associated with the Other Campaign a number of times since its inception a few years ago, so this new report comes as no surprise. What is troubling is that these 6 men are being charged as participating in "organized crime" which has been the key word for arresting drug traffickers that have reportedly been at the root of the intense violence around the U.S. border. Mexico has received millions to fight what is essentially the U.S. war on drugs, and now we have another case why this can be so problematic. Once the funds are allocated to and in the hands of the government (whether Mexico's as in this case - or the similarly funded Colombia's) there is little to no oversight as to how those funds are allocated. If the Mexican government sees fit to repress indigenous organizers as threats to the nation, they can do so simply by using the appropriate vocabulary of the oppressive state. Wondering how this is part of Mexico's drug war? "Felipe Calderon's war on drugs is largely fought through statewide "joint operations." In joint operations, the federal government deploys soldiers and federal police from various federal police forces to a particular state. The federal troops often work together with state and sometimes local police in anti-drug trafficking operations (although in other instances the federal troops relieve local police from their duties due to suspected corruption). Mexico's National Defense Ministry announced last October that it would expand its anti-drug operations to Chiapas. The government has confirmed that seven government agencies participated in the Bachajon operation that resulted in the eight detentions, including the military, federal police, and state police." Nice post. And crazy how language can be so slippery and have such awful consequences.